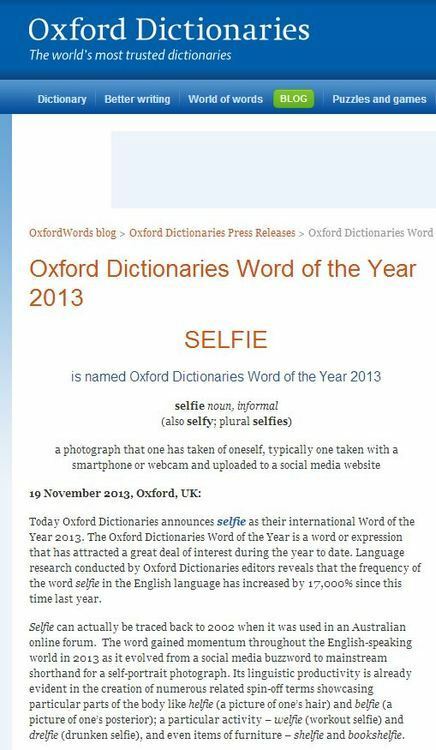 “Selfie” has been named as word of the year by Oxford Dictionaries. The word has evolved from a niche social media tag into a mainstream term for a self-portrait photograph, the editors said. Research suggested its frequency in the English language had increased by 17,000% in the last year, they added. Selfie’ has been named the word of 2013 by Oxford Dictionaries, beating ‘twerk’, ‘binge-watch’ and ‘showrooming’ as the most popular new term of the year. Editors from Oxford Dictionaries said selfie has evolved from a niche social media tag into a mainstream term for a self-portrait photograph. 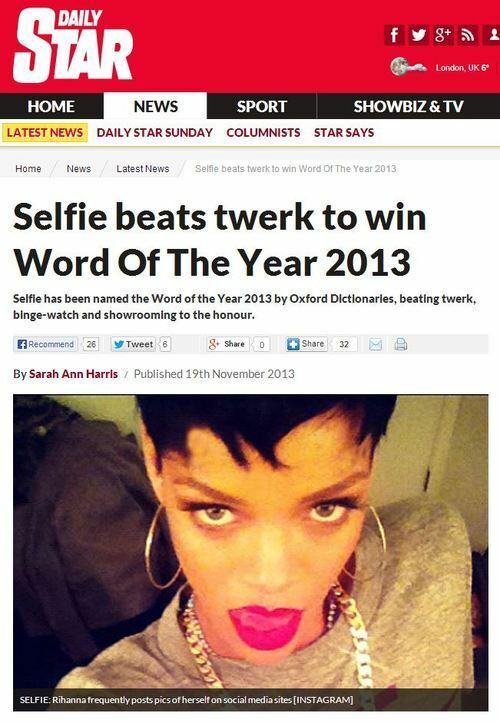 Selfie has been named the word of 2013, beating tough competition from twerk, binge-watch and showrooming. 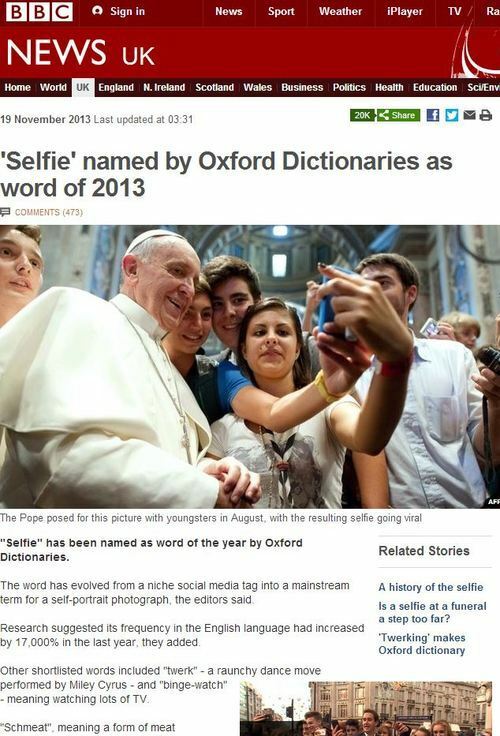 Editors from Oxford Dictionaries, which made it their Word of 2013, said the word has evolved from a niche social media tag into a mainstream term for a self-portrait photograph. 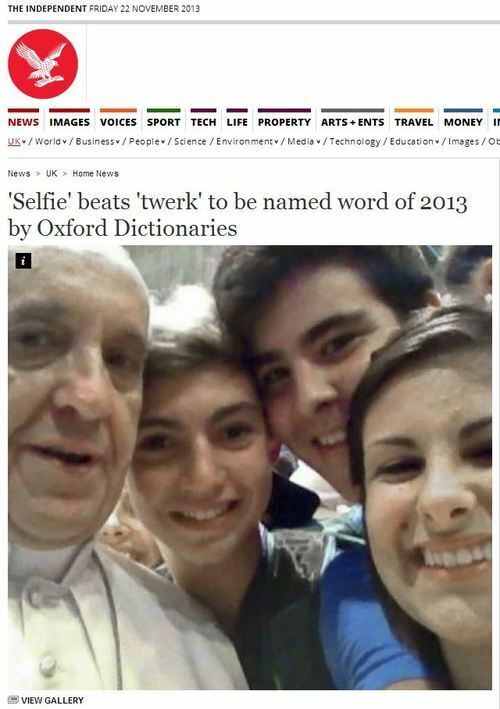 One of the most famous selfies this year was the Pope posing with teenagers at the Vatican. The picture went viral on social media and was widely speculated as being the first ever ‘Papal selfie’. 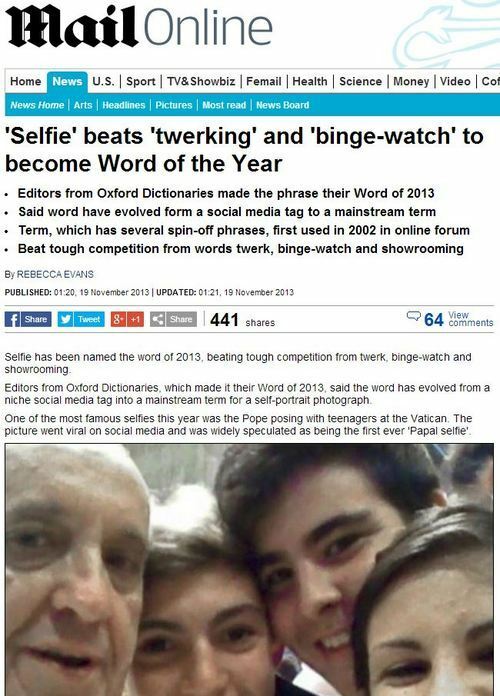 Selfie has been named the Word of the Year 2013 by Oxford Dictionaries, beating twerk, binge-watch and showrooming to the honour. The word selfie is described as “a photograph that one has taken of oneself, typically one taken with a smartphone or webcam and uploaded to a social media website”. And it has grown in popularity over recent months thanks to millions posting the pictures online. Celebs such as Justin Bieber, Rihanna and Miley Cyrus have added to the trend by regularly posting selfies on social media sites such as Instagram or Twitter. And so the quite remarkable level of coverage went on. Radio DJ’s dedicated playlists to it. Phone ins talked about it. The media lapped it up. Of course, there’s few points on offer to those who spotted the story was taken wholesale from an annual attention-seeking press release by dictionary company Oxford Dictionaries. Which of the plethora of news sources churned the press release most completely? According to Churnalism.com, the answer might surprise you… with the Guardian taking 82% of their article from the original press release. 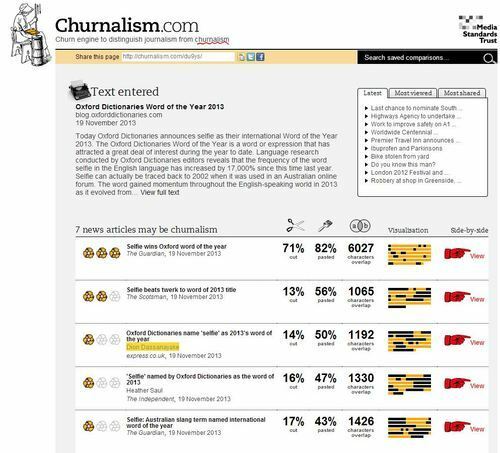 I wonder in which year the word ‘churnalism’ will be word of the year.